Whether you're at work, on the road or at home, you can now actively manage your appointments, communicate securely with your care team, view lab results, and much more. Ask about registration for myUCLAhealth during your next office visit. 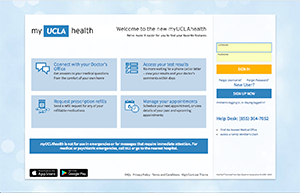 myUCLAhealth offers patients personalized and secure on-line access to portions of their health information. It enables you to securely use the Internet to help manage and receive information about your health. Is there a fee to use myUCLAhealth? myUCLAhealth is a free service offered to our patients. Patients who wish to participate will be issued a myUCLAhealth activation code during their office visit. This code will enable you to login and create your own user ID and password. Click here to request an activation code. Call our 24/7 Patient Help Desk (855) 364-7052 or email myUCLAhealth@mednet.ucla.edu.